I was playing with longstitches again and this is the result. 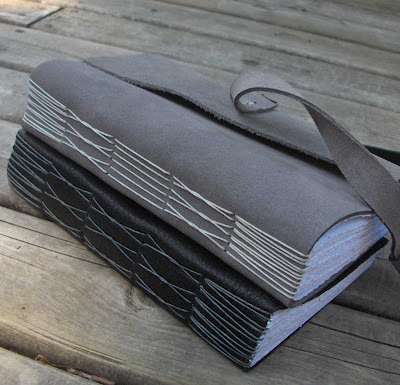 I am particularly happy with the grey one, everything worked perfectly and the combination of materials and proportions etc, just made a wonderful book. The black one has some marks on the leather so the end result wasn't quite as satisfying, although the binding itself is quite nice. Lovely binding, very elegant. Turned out beautifully, you're right to be pleased. these are lovely! very simple and beautiful! thanks carol, tulibri, and ali!! Your books are fantastic, you have inspired me to try leather and I am loving it. Thanks for you inspiration and sharing you knowledge with a newbie. Love those books.. I've been doing some coptic binding, but have never found leather cheap enough to make a journal. Those are beautiful!